Many of the years in the past, I have posted a reading list of sorts here for the year. This year I am a bit behind, but here's whats on my list for the dog days of summer. Enjoy! I mean does this need anymore of an explanation? 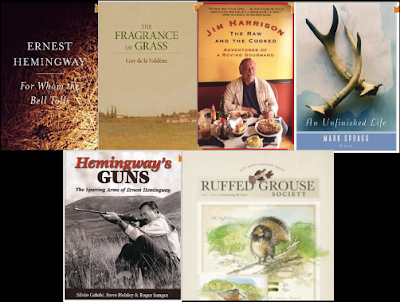 The stories of all of Hemingway's guns, how he acquired them and what he did with them. Brilliant idea for a book. I only hope it's decently written. A novel by one of the few fiction writers I read. I really liked Where Rivers Change Directions and The Fruit of Stone. Thanks to Tim DuBois for the introduction. The only novel written by one of my favorite non-fiction writers, Guy Del La Valdene. His non-fiction books on woodcock (Making Game) and bobwhite quail (For a Handful of Feathers) are both brilliantly written and wildly informative. OK, scratch Red Stag. I found out while penning this post that La Valdene has released his final book on hunting. It took him ten years to write. This book is getting moved to the top of the list. If you like the outdoors, hunting, fishing or just plain fantastic writing, you need to check this guy out. To revive my old tradition of reading a big heavy classic each summer. I plan to read it alongside #1. Although I should probably match the gun book with True at First Light, I am uninterested in posthumous publications after reading the last writings released by Edward Abbey's estate. Recently published books by long dead authors smell odd and leave a strange taste on the palette. Let me know if you know of an exception. A food book... of sorts, by Jim Harrison, who I know more closely from reading about him in non-fiction Thomas McGuane and Guy De La Valdene. OK, here's one that's a bit of self promotion, but I do plan to read. I was published as one of many authors in this collection of stories about hunting Ruffed Grouse. Despite the fact I am included... there is some stellar writing in here. There are a lot of short stories and magazines (mostly catching up on The Pointing Dog Journal and The Ruffed Grouse Society) I will read as well, but this is the list of the big ones. Can't wait to see what you are reading this year. Send your list along if you have a moment. Relax, have a cool drink and do some dog work this summer and we'll see you in the fall to make stories of our own.